Extremely sharp cutting heads are used when workpieces are machined in milling machines. There is a danger of lacerations and infections from cooling lubricants when the milling heads are installed/removed and during the measurement procedures. 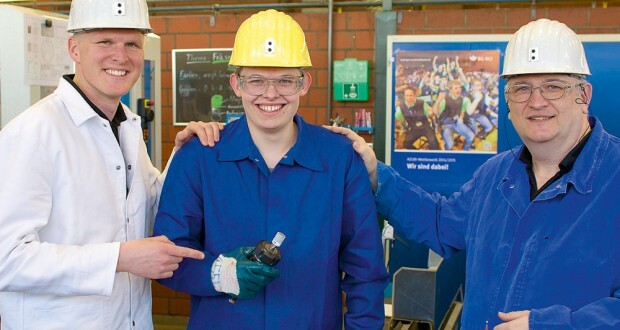 The trainee Felix Röwekämper had the right idea to make working safer. He developed a new type of individually adapted protective caps for milling heads and an appropriate storage unit to store them in. When a milling head fitted with a protective cap is installed in the machine, a magnetic base glued inside the cap ensures that the cap always remains close at hand after being removed. It is simply placed on a suitable area on the milling machine. The cap is put back on the milling head after the milling head has been exchanged or once work is finished. A storage unit for the caps ensures safe storage and removal of the milling heads. The simple, well-conceived design of these protective caps means that they can be produced cost-effectively and with very little time outlay. Employees can easily and quickly place the caps on the milling tools without having to remove or touch the milling tools first or when working on the milling machine. This makes working processes safer. At the same time, procedures are faster. The risk of injury in the machining room of the training centre at RAG Anthrazit Ibbenbüren GmbH has been significantly reduced by this new development. The new protective caps can be used for all types of milling heads and in all industry branches. Trainee Felix Röwekämper has been awarded the Special Award by the German Social Accident Insurance Institution for the Raw Materials and chemical Industry (BG RCI), sector of mining, for his engagement and valuable contribution to improving safety at work.